The Lord began to work on Chase's heart when he was traveling around the United States with Robby Dawkins, equipping churches for evangelism in 2011. He soon realized that God's true calling on his life was to plant a church in Columbus, GA. Chase had many doubts and questions when he looked at how many churches already existed in the area, but God showed him how HE wanted this expression of worship to be different. The Lord has a desire for this community be reached for Christ. A community with over 300 churches, has only 26% actively involved in their relationship with Jesus. Love Revolution Church is not just a church, but a movement dedicated to reaching the lost and broken. Our sole purpose is to restore the lost back to their relationship with Christ, equip them to step into what God has called them to do and release them into their calling! This was where we held our pre-launch meetings. We have certainly gone from glory to glory. 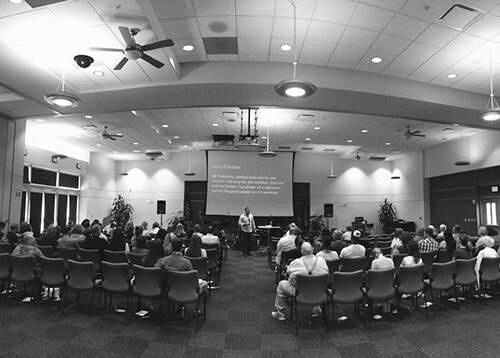 On January 5, 2014, we launched our first Sunday morning service at Columbus State University’s Cunningham Center! We now have a loving and powerful Church. Come join the movement of advancing the Kingdom of God in Columbus, GA!